Living in New York City sometimes feels like a dream come true — the hustle and bustle, the lights at night, the millions of people coming from all different places. But, if you’re anything like me, sometimes it feels as though the city is missing something vital. As humans, I believe we are inherently connected to nature. We look for nature in everything we do, we thrive in green spaces, and we instinctively reach for the more organic foods available to us. That’s why New York City is hard to handle: the concrete jungle, after all, is just that — concrete. So for when you’re feeling that itch for something more natural, something closer to your heart, check out Brooklyn Grange. Operating since 2010, Brooklyn Grange has taken on the task of promoting sustainability and local ecology through food, education, and events. 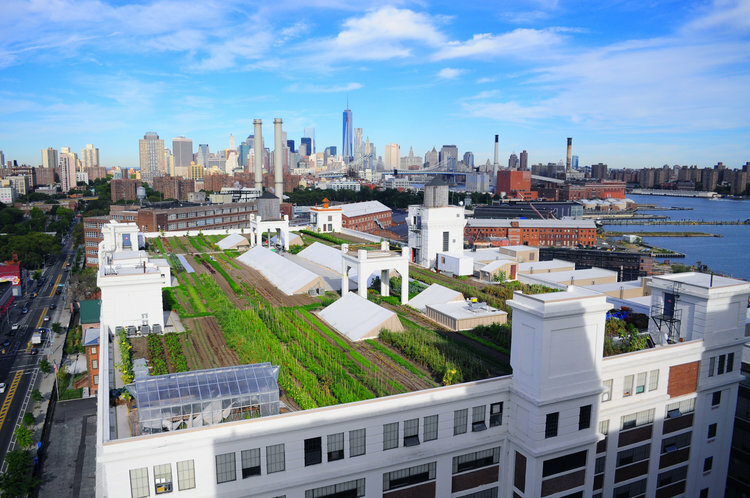 They operate the world’s largest rooftop soil farm, located on three roofs in New York: one in Brooklyn, one in Long Island City, and their newest one in Sunset Park. Over 60,000 pounds of organic food is produced every season. 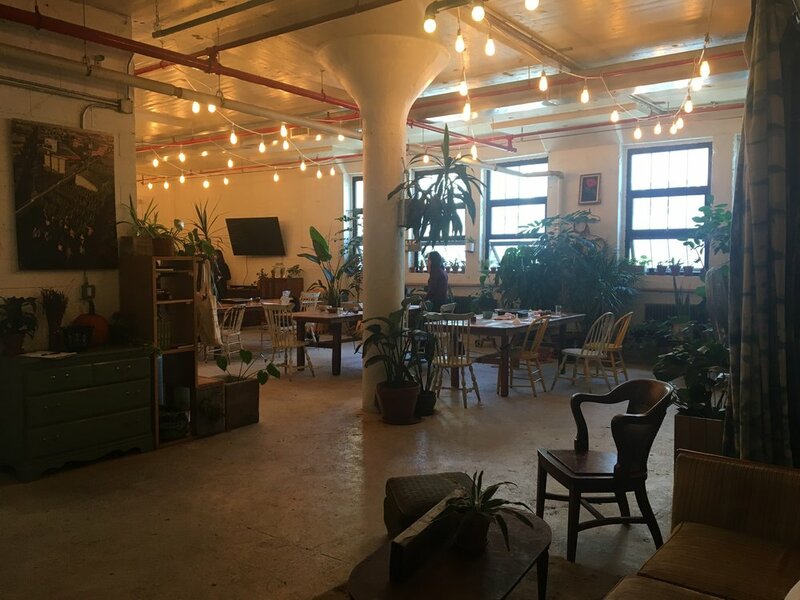 The farm in Long Island City is more of a community space — open to the public every Saturday during the growing season (May through the end of October). At this particular farm, they grow a large variety of vegetables, whereas the Brooklyn farm grows eighty percent greens mixes. The Brooklyn Farm sells mostly to restaurants such as Gramercy Tavern and The Vanderbilt, and they feature the chefs of these restaurants at private dinner events that they host throughout the growing season. The third roof in Sunset Park is still being finished, but it has much deeper soil and will be able to grow things like beets and soy. In addition to growing food, the Grange operates an apiary with over thirty beehives spread across different roofs in NYC. Some of these beehives are actually owned by the Grange, but others are owned by private clients. The Grange is doing more than just growing food — they’re teaching other people how to grow and use it too. Running just a farm in New York City isn’t profitable enough to keep a business going, so they also offer urban farming or green roof consulting and installation services to different clients all over the world. They also supplement their needs by hosting private events and classes that you can pay to partake in. A few years ago the Grange started giving tours occasionally to elementary school classes. This blew up pretty quickly, so they created a sister nonprofit called City Growers. In the past five years they’ve brought over 40,000 kids to the roofs. They also do after school programs, teaching kids about crops and environmental sustainability — but they also have fun things for them to interact with. There are three to four chickens on the farm that the kids get to name and raise themselves. The Grange doesn’t profit from these chickens — they don’t sell their eggs or butcher them, they’re just for the kids to connect the idea of a “farm” with the rooftop green space that they see in front of them. Educating kids and even adults about environmentalism and sustainability is extremely important because urban sustainability is the future of the environmental movement. Brooklyn Grange is a key example and leader in the urban environmentalism movement. Rooftop gardens and green spaces are a key aspect of urban environmentalism because they lower cooling costs in buildings, clean the air, take in rainwater, and they have good mental health benefits (green spaces are proven to make people feel happier and less stressed). 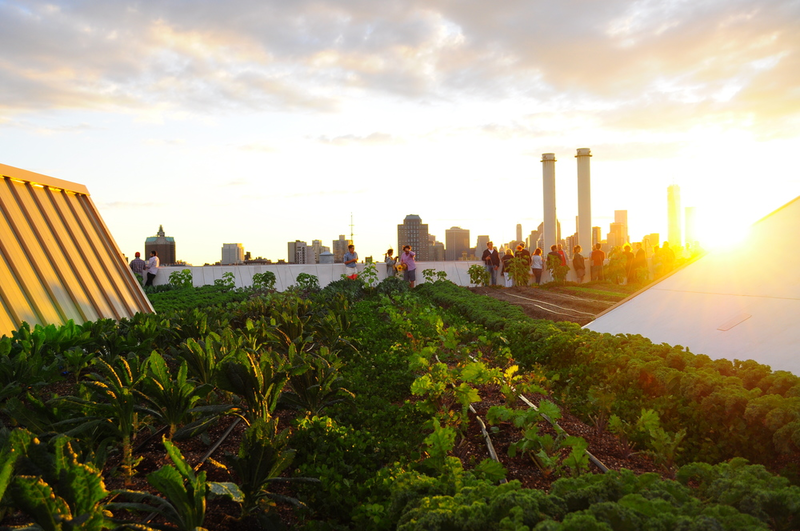 A rooftop farm is a step up from gardens, because it also creates food that can be purchased and used right here in the city, cutting down on the carbon footprint made by transporting fresh foods over long distances. The government recognizes the importance of these environmental services provided: there’s actually a grant program through the Department of Environmental Protection that gives money to landowners and small businesses to install green spaces on their roofs. The Grange was given a $600,000 grant to help build the Brooklyn farm. Now that the Brooklyn Grange is just about finished with their outdoor growing season, they’ve turned their attention to the four greenhouses they operate on the roof. It is these greenhouses and the introduction of microgreens that have allowed the company to pay farmers year round. All that’s planted on the roof during fall are cover crops like oats, which add nutrients back to the soil and help with erosion throughout the winter — just like on a regular farm. In addition to their agricultural endeavors, Brooklyn Grange also hosts classes, workshops, tours, and events that range from $15 to $90. One Sunday morning, I attended one of these classes: a jam-making class. Before the class began, I got a peek at the roof, with a tour guide describing the aspects of the farm and answering any questions we had. The actual class was inside, with free jam, crackers, and cheese plates set out, and cider for anyone who was interested. The class was led by Nicole Rutsch, a woman who creates and sells her own jams on Etsy and to different shops throughout the city. We learned which herbs to pair with different fruits, which cheeses those go best with, and how to make a cocktail out of jams. She then provided us with different recipes: strawberry and habanero, peach raspberry with lavender, and plum with sage and honey. We made the plum recipe because it stores longer than the other ones. Then she showed us how to actually make the jam, about a thirty minute process where we roasted the plums, mashed them up in a pot, added all the ingredients (sage, honey, sugar, lemon juice, and pectin) let the whole thing simmer for about ten minutes, and then jar it. Afterwards, we shared conversation over the jam cocktails we made. Visiting the space was definitely a treat. Fifteen dollars for a tour isn’t unreasonable, just to see the rows of greens they have, the chickens, the greenhouses. It’s surreal to squish your feet in mud, run your fingers through fresh leaves, and have the cityscape in your peripheral. Cities have always been considered the degradation of nature -— the place one escapes from rather than to. However, in a world where living close together and sharing resources could help save our truly “wild” places, cities have a growing responsibility. Rather than contributing to environmental disaster, they have the potential to become part of our solution to the worsening effects of climate change. We can all take lessons from Brooklyn Grange: to make our air and water cleaner, to create less food waste, and to advocate for a more sustainable New York City and world.